Vanessa Hudgens flashes a peace sign as she wanders around the 2008 Environmental Youth Conference at the Los Angeles Convention Center earlier this month. The 20-year-old HSM sweetheart was joined by co-stars and friends Olesya Rulin, Jennifer Stone, Alyson Stoner and David Henrie. Brenda Song stands beside her real-life little brother Nathan, hoping he’ll take the heavy bag of vegetables that she’s holding in one of the new episodes of Disney Channel’s Pass The Plate. The 20-year-old Suite Life on Deck sweetheart hosts the multicultural series that aims to inspire kids and preteens to lead a healthier lifestyle by sharing cultural and historical facts about food and cooking. Check out all four new episodes — Fruit, Vegetables, Grain and Fish! Ashley Tisdale: I Have A Hot Trainer! Ashley Tisdale takes a short break to give us a behind-the-scenes look at her Shape magazine photo shoot. Catch the rest of the Tizz’s interview below! Zac Efron Sends Christmas Wishes! Zac Efron took a break from his own holiday festivities with his family to write a special message to one of his fansites, Zefron.com. The Jonas Brothers: Joy To The World! The Jonas Brothers keep close together as they rock out on stage for the Walt Disney World Christmas Parade at Disneyland. Sabrina, Kiely & Adrienne: Have A Cheetah-licious Christmas! The Cheetah Girls — Sabrina Bryan, Adrienne Bailon and Kiely Williams — chime in during one of their tour stops to record a holiday message for all their fans, wishing them a very Cheetah-licious Christmas. On touring with her best friends: It’s awesome! We wish it was longer. We actually just get addicted to the tour life. We love our bus and getting to hang out with our dancers. We just love touring! On her favorite song to perform: I really love “Dance Me If You Can.” It’s a really good number to perform on stage. The crowd loves it. On the Jonas Brothers: We love the Jonas Brothers! They opened up for us on our first tour ever. So, we’d love to do a double heading Jonas Brothers/Cheetah Girls something tour! Selena Gomez takes a break from her Christmas festivities to make a special greeting for all her fans. Selena was sure to make the point that after they sang, she did, in fact, do her homework! Vanessa Hudgens keeps it comfy and casual in a gray sweatsuit as she slips out of Frends Beauty Supply Company store in Los Angeles on Wednesday afternoon. The 20-year-old “Gone With The Wind” singer was out with lil sis Stella picking up some last minute Christmas goodies. Vanessa and boyfriend Zac Efron were seen out and about over the weekend, enjoying Barney’s of New York’s holiday sale. Ashley Tisdale poses proud in her tiny yellow bikini on the cover of the January 2009 issue of Shape magazine. High School Musical hotties and BFFs Ashley Tisdale and Olesya Rulin strut their stuff down the street as they do some holiday shopping at Planet Blue in Los Angeles on Monday afternoon. Earlier in the day, Ash also had her hair done at Byron & Tracey salon in Beverly Hills. On-and-off-screen sweethearts Vanessa Hudgens and Zac Efron do some last minute Christmas shopping at Barney’s of New York in Los Angeles on Monday evening. Vanessa, 20, was recently seen filming an Ecko Red commercial in L.A. and snuck in a little Christmas shopping herself without Zac. The duo will be heading overseas to Tokyo, Japan for the last leg of HSM3 promo in January. Selena Gomez Has a Totally New Year! The Wizards of Waverly Place cast — Selena Gomez, Jake T. Austin, David Henrie and Jennifer Stone — keep close together in the photo booth at the taping of Disney Channel’s Totally New Year special. The foursome will host the new year’s celebration and welcome fellow Disney stars such as Brenda Song, Alyson Stoner and Mitchel Musso to party with them as they countdown the last hours of 2008. Viewers can now vote on DisneyChannel.com to determine what will be shown on the program. From music videos to TV shows, it’s all up to the viewers. Go vote! Be sure to tune into Disney Channel on Wednesday, December 31st @ 6PM ET/PT to see what your favorites of the year were! Former Suite Life of Zack and Cody star Ashley Tisdale lounges on the deck of the S.S. Tipton with Brenda Song and Debby Ryan as she returns to her roots in the spin-off show, The Suite Life on Deck. The 23-year-old actress returns to the show as London’s (Song) BFF, Maddie Fitzpatrick and gains a new friend in Bailey (Ryan). In the brand-new episode entitled, “Maddie on Deck,” Maddie captures the heart of 8-year-old prince, Jeffy of Linchtenstamp, and she’s even more surprised to find out he wants her hand in marriage. It’s again, up to Zack and Cody (Dylan and Cole Sprouse) to win back Maddie’s honor. Selena Gomez steps out in a pair of Modern Vintage Vinny boots as she does some furniture shopping with mom Mandy at the H.D. Buttercup shop on Sunday afternoon in Los Angeles. The 16-year-old Wizards of Waverly Place leading lady who recently moved, dished to J-14 magazine about her own life story. She shares, “My [role model] is first and foremost my mom.” Her mother, Mandy, had Selena when she was 16-years-old. 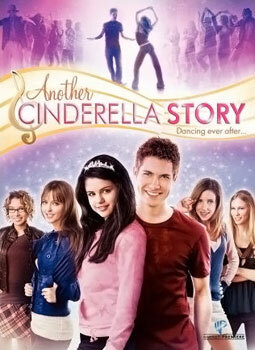 Selena’s movie, Another Cinderella Story, will air on ABC Family in the new year on January 18th @ 8PM ET/PT. The film is the sequel to the 2004 Hilary Duff flick, A Cinderella Story, that follows the same storyline: A guy dances with the girl of his dreams at a costume ball and only has one hint to who she is and is on a mission to find her. Vanessa Hudgens shows off her toned legs in cute pink short shorts as she shoots a commercial for Marc Ecko in Los Angeles on Saturday afternoon. The 20-year-old High School Musical hottie paired off her pink shorts with striped stockings (”Sneakernight“, anyone?) and black high-top Ecko Red sneakers. Vanessa’s blockbuster hit, High School Musical 3: Senior Year, is coming to DVD in February 2009. The two-disc will have tons of bonus features including bloopers, deleted scenes and the tearful cast goodbyes. Vanessa Hudgens takes a big bite out of her lunch on the set of filming a Marc Ecko commercial on Saturday afternoon in West Hollywood, Calif. The 20-year-old “Hook It Up” hottie was also seen with a Live! At Sunset shopping bag. Wonder if she did some last minute Christmas shopping like her BFF Ashley Tisdale did yesterday too. Vanessa’s Ecko Red commercial will air sometime next year. Candace Flynn (voiced by Ashley Tisdale) from Disney’s animated series, Phineas and Ferb, has only one wish on her Christmas List: To bust her brothers! On her holiday plans: I’m going to be vigilant. My brothers are always up to something. On where festivities are going on: At home with the family. Hopefully Jeremy will come over. On her family traditions: Well, Phineas and Ferb always do something outrageous, I try to bust them for it and Mom never sees it. It’s pretty much like the rest of the year, except with presents. On her favorite holiday dish: Mom likes to make Fruitcake “In honor” of me. Not sure what she means by that. On her favorite holiday decoration: I have this one ornament that I pasted a photo of Jeremy on. I put it at the back of the tree so nobody else sees it, but sometimes when I can’t sleep, I come downstairs and wedge myself between the tree and the wall with a flashlight so it’s like we’re having our own little holiday party and- . . . uh . . .Does that sound obsessive? On her favorite holiday song: (Singing) “You better Watch out” It reminds me of my brothers. On favorite holiday memories: Last year, I watched Jeremy trimming his tree. He looked so close through the binoculars, like I could reach out and touch him. On what’s on her Christmas list: Oh, I don’t know. Maybe I could BUST MY BROTHERS?! Would that be too much to ask? On the greatest gift she’s received: Maybe those binoculars. On where she wants to spend Christmas: I would spend it with Jeremy… on some romantic island… busting my brothers. The Jonas Brothers pose together as they receive a plaque of recognition from the House of Records in Mexico City on Sunday afternoon. The rock group’s “A Little Bit Longer” album has been certified gold (40,000 copies) in Mexico. Nick, Joe, and Kevin also performed on Saturday at the capital’s Foro Sol stadium, which seats almost 40,000 people. The Cheetah Girls’ Kiely Williams rocks it out center stage at the jobing.com Arena on Friday night in Glendale, Arizona. Kiely, 22, and her fellow cheetahs Adrienne Bailon, 25, and Sabrina Bryan, 24, played their last concert on the One World tour at the Honda Center in Anaheim, Calif. The Cheetah Girls: One World DVD is out in stores now and jam-packed with bonus features including a never-before-seen dance sequence to the bonus track, “Feels Like Love.” Be sure to pick up a copy! Ashley Tisdale makes her way through the busy crowds to do some last minute shopping with mom Lisa at Kitson in Los Angeles on Saturday afternoon. The 23-year-old Headstrong hottie picked up a pair of moccasins, a California Love sweater, a pair of cute jean shorts, and special holiday Kitson candle. Ashley also made her way out of the store with a couple pairs of boots. The Tizz and her mom later stopped for …after their last-minute Christmas shopping spree. Hope they got all they needed! Miley Cyrus is ready to pop out of the stage of her “Best of Both Worlds” tour in E!’s True Hollywood Story: From A to Zac, that aired Friday night (December 19th). The 16-year-old Hannah Montana starlet’s career was examined — from her hit TV show to her concerts. Check out the rest of Miley’s True Hollywood Story below! Zac Efron gives back by bringing tons of children the spirit of Christmas at the Mattel Children’s Hospital at UCLA on Friday in Los Angeles. The 21-year-old actor joined Gifts.com in giving presents out to all the patients at the hospital. Zac took the time to sign autographs and pose for pictures. Selena Gomez wraps her arm around Santa at the Pepsi Holiday House to make a donation to the Clothes Off Our Back charity in Los Angeles on Saturday afternoon. The 16-year-old Wizards of Waverly Place starlet dished to JJJ on what she has planned for the upcoming holiday season. On what she wants for Christmas: I already got it. The gift of being able to be home with my friends and family. On her favorite tasty treats: My favorite decoration would have to be the ornament I made for my mom when I was 5. I made it out of popsicle sticks and a picture of my house. On special holiday memories: I think every year is special. It’s our moment and our family’s chance to just sit back and not worry about anything and just be with each other so I think every Christmas counts for us. On her favorite holiday dish: My favorite dish is my Nana’s homemade stuffing. She makes it all homemade and it takes about two hours, but it’s unbelievable and she always has to make two pots so that I can have some left over. On her holiday plans: This will be the first year that I’ll be able to go home since I moved away from Texas, so I’ll be spending the holidays with my family on my dad’s side and my mom’s side and coming back to Texas for a good two weeks and doing nothing, which is very refreshing. On her favorite holiday song and movie: I love The Grinch with Jim Carrey! Every year I watch that movie. My favorite song would have to be “Have Yourself a Merry Little Christmas” by Christina Aguilera. On family traditions: I split my holidays up because my parents are separated so every tradition would have to be Christmas day with my mom and her family and then Christmas Eve with my Dad and his family and there comes a point when we all come together and wish each other Merry Christmas. On the best gift she’s ever gotten: The best gift I ever got was a vintage jewelry box that my mom bought me. It’s one of a kind and it’s kind of antique-ish looking and has these really neat faded pink colors and these purple colors. It’s beautiful and I love that. On where she would love to celebrate Christmas: I would have to say home. If I could spend it with anybody it would just be my family at home. Demi Lovato lets us take a walk through her life in her music video for her second single, “La La Land”. The 16-year-old performer starts off on a talk-show with co-star Doug Brochu and ends up walking through the streets of Hollywood, where you can spot all the rest of the Sonny With A Chance gang. Can you spot Demi’s older sister, Dallas Lovato anywhere? Zac Efron was one of many young celebrities featured on tonight’s E! True Hollywood Story: From A to Zac. The 21-year-old High School Musical hunk’s career was highlighted as well as his relationship relationship with girlfriend and co-star Vanessa Hudgens. Zac’s former Summerland co-star Lori Loughlin had this to say about the couple: “The fact that he and Vanessa have been together for so long speaks to who he is also as a person. He tends to be that one woman guy and just focus on that; again not a player, not somebody’s who’s taking advantage of this new found fame or I’m sure the many girls that are throwing themselves at him. He seems to very level headed about the whole thing. High School Musical 3 Comes To DVD! Everyone’s favorite East High-ers — Zac Efron, Vanessa Hudgens, Ashley Tisdale, Lucas Grabeel, Corbin Bleu, and Monique Coleman — are finally bringing their blockbuster hit, High School Musical 3: Senior Year, to DVD and Blu-ray! HSM3 hits shelves on February 17th, 2009. Be sure to pick up your own copy! The Jonas Brothers are ready to hit the big screen early next year and MTV is bringing you a first look at it all with their new 3D Concert Experience. The musical trio — Nick, Joe, and Kevin — will premiere a never-before-heard song, “Love Is On Its Way” during the movie, set to release February 2009. Vanessa Hudgens chats away on her iPhone as she exits a recording studio on Thursday afternoon in Westwood, Calif. The 20-year-old Identified singer was recording songs for her upcoming movie, Bandslam. Vanessa plays Sa5m, a 15-year-old girl who has a stuttering problem but breaks out of her shell when she gets involved in a battle of the bands competition. The movie also stars Alyson Michalka and former Friends star Lisa Kudrow. Bandslam hits theaters in July 2009. Vanessa wore Wildfox Couture’s “Light Feather” raglan tee. FYI: It’s also possible Vanessa was leaving a legal depositon for a 2005 agreement between her and former manager Johnny Vieira. The Suite Life on Deck sweetheart Debby Ryan is ready for the holidays and is even more excited about going back to Texas to celebrate. On her plans for the holidays: Every year is slightly different, but it usually involves having people over. Some years we all feast or play in the snow, or go caroling or watch a movie. This year, we plan to do our usual Christmas traditions and somehow fit in moving our furniture and everything from our home in Texas to our new house in California! On her holiday destination: I love the way I spend the holidays. It’s a warm combination of my family, friends, familiar houses and my home and I am so thankful for it! On where she’ll be celebrating: At home in Keller, TX and visiting a lot of extended family in San Antonio, TX. On her favorite holiday movie: We have watched either Miracle on 34th Street or The Little Drummer Boy every year and a lot of times we go out to see a new one together and with friends. The entire Sonny With A Chance cast will join Wizards Selena Gomez and David Henrie for the new year celebration. Disney Channel viewers can go online to choose what they want to see on New Year’s Eve - from favorite music videos to favorite TV shows, it’s all up to you! David Henrie and his main squeeze Lucy Hale keep close at the HFPA Salute to Young Hollywood party at Nobu restaurant in Los Angeles on Wednesday night. The duo was recently seen checking out Wicked, the untold musical tale of Oz’s witches. Lucy, 19, currently stars in Privileged as Rose Baker. The show follows a Yale-educated journalism major (JoAnna Garcia) who becomes a live-in tutor for two spoiled grand-daughters (Hale, Ashley Newbrough) of a Palm Beach cosmetics business magnate. Privileged airs Tuesdays on CW @ 9PM ET/PT. Vanessa Hudgens clutches onto her Balenciaga bag as struggles to keep her black pea coat closed on her way to a business meeting in Los Angeles on Wednesday afternoon. The 20-year-old Bandslam beauty was out last night with boyfriend Zac Efron. Vanessa was really into the L.A. Lakers game and slipped in a hug from soccer star David Beckham. The Lakers won the game against the New York Knicks, 116 to 114. Zac & Vanessa: Let’s Go Lakers! Zac Efron and girlfriend Vanessa Hudgens sit front row at the L.A. Lakers game against the New York Knicks at the Staples Center in Los Angeles on Tuesday evening. Vanessa, 20, wore her stellar black, knee-high boots and was seen stealing a hug from soccer superstar David Beckham. The High School Musical sweethearts enjoyed a day out on Sunday, celebrating Vanessa’s 20th birthday. They’re also set to travel to Tokyo, Japan next month for the last leg of their promo tour for their film, High School Musical 3: Senior Year. Cheetah Girl Adrienne Bailon takes a breath from shopping at American Eagle Outfitters to pose with her papa Freddie in New York City on Tuesday. Demi Lovato gets dolled up in a gorgeous purple gown on the cover of Seventeen’s special prom issue, on stands in January. Vanessa Hudgens: Peace Out People! Vanessa Hudgens rocks out Christian Dior snow boots and flashes a peace sign to photographers as she goes shopping for a new mattress with her mom in Glendale, Calif., on Monday. The 20-year-old actress celebrated her birthday on Saturday with on-and-off screen boyfriend, Zac Efron, who brought her favorite pink lilies and a surprise gift! Selena Gomez, along with co-stars David Henrie and Jennifer Stone, wish you a very happy holiday season in one of four new PSAs from the Disney Channel. Check out all the Disney Channel stars wishing you Happy Holidays! Debby Ryan: Good Morning, Texas! The Suite Life on Deck star Debby Ryan stopped by Good Morning Texas during her Thanksgiving break late last month. Check out the rest of Debby’s interview below! Selena Gomez took a break in her busy schedule to sit down and talk with Tiger Beat mag about her New Year’s Resolution. The Jonas Brothers get in the holiday spirit as they decorate a Christmas tree during a photo shoot for People. The musical trio — Nick, Joe and Kevin — are huge Christmas fans. They love it so much that they wear their pajamas inside out! Check out the rest of the JoBros photo shoot below! Ashley Tisdale holds on tight to boyfriend Jared Murillo as they make their way into JFK airport in New York City on Monday morning. The High School Musical sweethearts spent the weekend in the Big Apple where Ashley, 23, co-hosted Z100’s Jingle Ball 2008 along with Australian singing sisters The Veronicas and Nick Lachey. Performers Chris Brown, Jesse McCartney, Ne-Yo, Brandy, David Archuleta and Rihanna took the stage on Friday night to entertain the crowd of thousands of fans. Zac to Vanessa: Happy 20th Birthday! Zac Efron and girlfriend Vanessa Hudgens share a smile as they make their way to Los Angeles eatery Stanley’s in L.A. on Sunday afternoon. The 21-year-old actor surprised his High School Musical sweetheart with a bouquet of flowers and a very large gift under his arm as he picked her up this afternoon to celebrate her 20th birthday. Birthday girl Vanessa Hudgens poses with BFFs Olesya Rulin and Jennifer Stone at the 2008 Environmental Youth Conference at the Los Angeles Convention Center in L.A. on Saturday night. The 20-year-old actress and her friends, joined by pals David Henrie and Alyson Stoner, participated in introducing key-note speaker, Alec Loorz. They also helped promote Million Trees LA which is a cooperative effort between the City of Los Angeles, community groups, businesses, and individuals working together to plant and provide long-term stewardship of one million trees planted where they’re needed most. 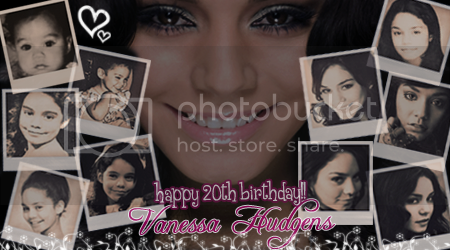 Today Vanessa Hudgens turns 20, i hope she has a lot of fun with her friends and family. Zac Efron tries to impress the school bully in one of three new stills from his upcoming comedy, 17 Again. The 21-year-old Hairspray hunk stars as the younger version of Mike O’Donnell. The movie is about a guy whose life didn’t quite turn out how he wanted it to and wishes he could go back to high school and change it. He wakes up one day to find his wish came true and gets the chance to rewrite his life. The film is set to hit theaters in April 2009 and co-stars Matthew Perry, Michelle Trachtenberg and Sonny With A Chance’s Sterling Knight. CLICK TITLE TO SEE MORE PICTURES. Vanessa Hudgens: I’m So Lazy With My Skincare! Vanessa Hudgens admits that she’s always been lazy with her skincare to US Weekly backstage at MTV’s TRL. Vanessa is a spokesperson for Neutrogena, the company that sells The Wave. Check out the rest of her interview below! Miley Cyrus: A Porsche for Christmas! Miley Cyrus not only just got a Golden Globe nomination, but she’s putting that learner’s permit to good use too. So what type of car is it? A Porsche Cayenne, just like the one Hayden Panettiere has. ‘Sonny With A Chance’ Preview! It’s here! Take a look at the first, full promo for Demi Lovato’s new series, Sonny With A Chance. The series, set to premiere on Disney Channel in 2009, follows Sonny Munroe (Lovato) as she gets every girl’s dream come true by getting a starring role on a comedy sketch show, So Random!. Former Facts Of Life star Nancy McKeon stars as Sonny’s mom, Connie Munroe. Take a look below! Ashley Tisdale arrives at the pre-show to Z100’s Jingle Ball 2008 in New York City’s Madison Square Garden on Friday evening. The 23-year-old High School Musical star will host the evening’s festivities with Nick Lachey while Chris Brown, Jesse McCartney, Ne-Yo, Brandy, David Archuleta and more perform at the star-studded event. Hilary Duff may not be Lizzie McGuire anymore, but that doesn’t mean she still isn’t a Disney girl at heart. The 21-year-old Reach Out singer has been the face of Disney Mobile for a while, promoting the sparkly, slim cell phones in Japan. The Disney Mobile commercials have finally appeared on YouTube. Hilary sings the classics, “A Dream Is A Wish Your Heart Makes” and “When You Wish Upon A Star.” She even performs the “Mickey Mouse March” that Britney Spears, Justin Timberlake and Keri Russell used to sing once upon a time. Check out the commercials below! Ashley Tisdale and boyfriend Jared Murillo head to LAX airport with their Gucci luggage in Los Angeles on Thursday afternoon. The 23-year-old High School Musical actress was seen earlier today having coffee with her dad Mike at her fave shop, The Coffee Bean.